The AEG 18V Brushless Heavy Duty 2-piece kit is designed to handle extreme applications. This kit includes our new innovative high-performance FUSION Brushless Heavy Duty Hammer Drill with 140Nm of Torque, equipped with the latest Advanced Brushless Technology with intelligent software and hardware. Built for professional tradesmen, FUSION tools paired with the new FORCE batteries will provide extreme power and run-time. 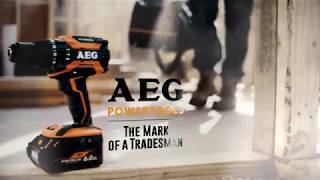 FUSION tools are The Next Evolution of AEG Powertools and are AEG’s most powerful and efficient tools to date with Advanced Brushless Motors boosted with intelligent software and hardware. FORCE batteries are AEG’s most advanced batteries with next-gen cell technology and smart systems to deliver more power for longer. Brushless technology gives you maximum performance, longer run-time and extended motor life. FORCE batteries are backwards compatible with all AEG 18V products and will boost the performance of your existing 18V AEG Powertools by up to 25%.